[dropcap color=”#008040″ boxed=”yes” boxed_radius=”8px” class=”” id=””]I[/dropcap]n a setback to DMK leader Kanimozhi Karunanidhi, the Supreme Court on Tuesday dismissed her plea for quashing of charges against her in an alleged bribe-turned-corporate loan case but allowed them to move the Delhi High Court against the 2G court’s final order. Besides Kanimozhi, a bench of Chief Justice H. L. Dattu, Justice A. K. Sikri and Justice Rohinton Fali Nariman also rejected similar plea by Swan Telecom promoter Shahid Usman Balwa. 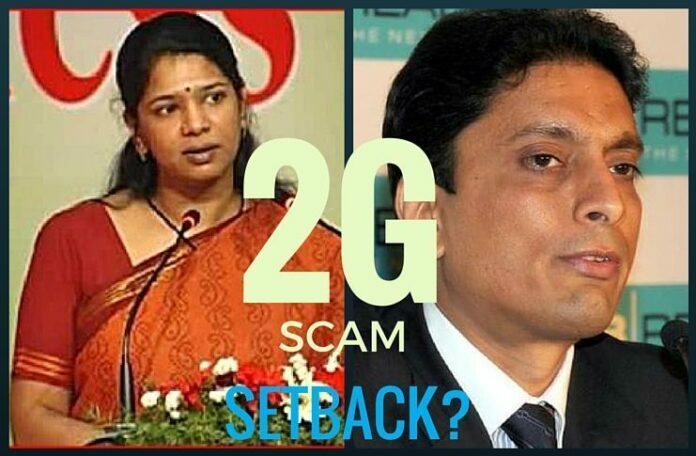 However, the court, by modifying its earlier order, allowed Kanimozhi, Balwa and other similarly placed accused in 2G cases to approach the Delhi High Court to appeal against the final order of the special court holding the trial of 2G scam-related cases. [dropcap color=”#008040″ boxed=”yes” boxed_radius=”8px” class=”” id=””]I[/dropcap]t also made it clear that the high court will not entertain any appeal against any interim order passed by the 2G sp ecial court. The court order rejecting Kanimozhi and Balwa’s plea came as it noted that the trial was almost over, saying Special Public Prosecutor Anand Grover has submitted that recording of evidence is over and final arguments are nearing completion. Allowing Kanimozhi, Balwa and others to approach the Delhi High Court against any adverse order by the special court holding trial of 2G cases, the court has modified its February 14, 2011 and April 10, 2011 orders saying that any appeal against the trial court’s order could only be made before the apex court, thereby barring the high court from entertaining any such matter. Assailing the Central Bureau of Investigation (CBI) charge sheet, Sharan told the court that investigating agency said his client was the “active brain behind Kalaignar TV” and even if she was, it was no ground to proceed against her. Dismissing the plea, Chief Justice Dattu said that the burden of proving the case was on the CBI and why should the accused be deprived of another opportunity to demonstrate her innocence. The CBI had charge sheeted Kanimozhi alleging that Rs 200 crore “illegal gratification” was routed from Dynamix Realty to Kalaignar TV through Kusegaon Fruits and Vegetables Pvt Ltd and Cineyug Films Pvt Ltd of Balwa.